In his first appearance as a featherweight in nearly six years, Tyson Griffin made a significant splash. former WEC title contender. Two of the three cageside judges saw it 29-28 for Griffin. A third scored it a 29-29 draw. the head and body. 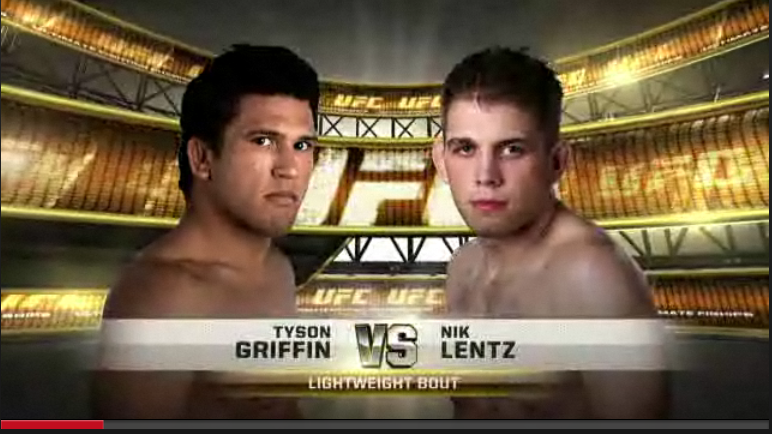 The victory brought an end to Griffin’s three-fight losing streak. All of the fights from the UFC’s upcoming card will be available for free. Sunday’s UFC on Versus 4 main card airs live on Versus with a Nate Marquardt vs. Rick Story headliner from CONSOL Energy Center in Pittsburgh. UFC officials since have revealed that all eight of the night’s preliminary-card fights will stream for free on Facebook. Notable competitors from the card include Tyson Griffin, Joe Stevenson and Joe Lauzon. Griffin and Stevenson, who are former UFC lightweight contenders, make their featherweight debuts against respective opponents Manny Gamburyan and Javier Vazquez. Additionally, Lauzon takes on fellow lightweight Curt Warburton, and former middleweight Rich Attonito drops to welterweight to take on Daniel Roberts. The Facebook stream begins at approximately 6 p.m. ET (3 p.m. PT), and the Versus card airs ay 9 p.m. ET (6 p.m. PT). The UFC’s Facebook page (www.facebook.com/ufc) has been used to stream a host of events this year. UFC president Dana White plans to make the social-networking giant a frequent complement to its future TV broadcasts. UFC 123 Weigh-In Video . Join Xtreme Couture’s staff and gym members Saturday Night at 6pm to watch UFC 123. Light snacks will be provided. Cost is free to Xtreme Couture Members. Call 702-616-1022 for more information. As 2010 dawned, any talk of Xtreme Couture MMA fighter, Tyson Griffin ,usually involved his place in the lightweight title picture thanks to back-to-back victories over Rafael dos Anjos and Hermes Franca. Two fights since then the talk is a lot a different, and the Sacramento native has heard it all. So if you think the 26-year old is caught in a downward spiral that will continue into his UFC 123 bout this weekend against Nik Lentz, think again. For him, Saturday night kicks off a new beginning to a career that is far from over. “I took a lot of time off after the Gomi fight and did a lot of soul searching and all that kinda stuff and I definitely feel like my career is kinda just starting,” said Griffin, who admits that following his decision loss to Xtreme Couture teammate Dunham in June, he started to re-evaluate where he was in his career and in life. But then came the Gomi fight less than two months later and a crushing 64 second knockout defeat. The hill then became a mountain, but he’s packed his proverbial hiking boots for the trip. What Griffin’s soul searching consisted of was going through every aspect of his life and seeing where he could remove distractions and improve the quality of his training. He also brought in a secret weapon that’s not so secret anymore – his brother, former Oklahoma State wrestler Kyle Griffin. And though Griffin has always been seen as a wrestling-based fighter, as the quality of the game elevates, so must every aspect of a fighter’s game. For Griffin, who began wrestling in middle school, he will find himself at a disadvantage against someone like Lentz, a Division I college wrestler. “I’ve really relied on my athleticism and my creativity when it comes to wrestling and it’s hard to do against these guys who have been wrestling since they were four years old,” he admits, but that just comes part and parcel with a game that is always evolving. Luckily for Griffin, he’s been paying attention the entire time. Against Lentz, Griffin will have to be prepared for everything because despite his less than scintillating win over Andre Winner earlier this year, the Minnesotan can handle himself wherever the fight goes, and if he wants it to end up on the mat with him in total positional control, he can probably pull that off. That’s not what Griffin wants though, and he’s prepared accordingly. If anything, Griffin has made it clear that there are no doubts in his mind after his last two bouts, no questions of whether he can make it to the next level that seemed a given after he won five of his first six UFC fights. Instead, Griffin is aware that this is not a sprint, it’s a marathon, and that he’s just getting started on the second leg of the race. A little luck never hurt either, and if he’s looking for some interesting omens surrounding his ‘new beginning’, he only needs to look at the UFC 123 fight card, where he’s opening the event for the first time since his Octagon debut against David Lee back in 2006. Also on that card? Matt Hughes and BJ Penn, who compete in their rubber match this weekend. Griffin chuckles when informed of those two tidbits.